The next technique that we teach is the New Life Mantra. 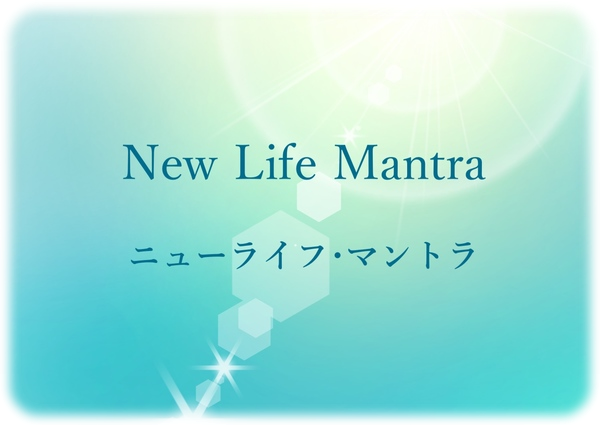 The New Life Mantra creates a new life with more love, more support from the Universe, and more expansion of all the abilities and perception we need in this life. With the New Life Mantra, we receive an empowerment that takes us down deep inside the Earth and connects and grounds us with the support of Mother Earth. At the same time, we also receive an empowerment that takes us up into the sky and expands our perception with the higher perspective and view from the Spiritual Consciousness of the Infinite Sky we call Heaven. With the New Life Mantra, we stretch the Love by connecting with Mother Earth and the new energy of Higher Dimensions that are coming in from Heaven. That is New Life! It is very integrating. As you stretch both directions high and low, you are also strengthening your Center in the Heart. At this time on Earth many people are feeling it is time to start living the real life they have dreamed of becoming. The life we have wanted to live but never thought it was practical for our life in the real world. The New Life Mantra helps us to actualize that dream.